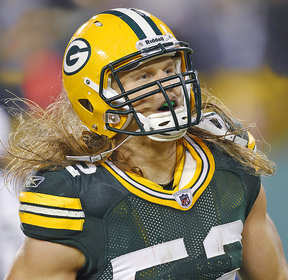 CHICAGO, IL--(Marketwire - January 31, 2011) - Green Bay Packers linebacker Clay Matthews III has won the third annual professional Butkus Award® honoring the best linebacker in professional football. The Award was presented during a weekend special edition of the television program Pro Football Weekly, after Matthews was selected by a panel of 51 coaches, recruiters, scouts and journalists. Among the 12 professional linebackers receiving votes, James Harrison of the Super Bowl Pittsburgh Steelers finished second, resulting in a Super Bowl matchup of top linebackers. Tied for third were Brian Urlacher of the Chicago Bears, Patrick Willis of the San Francisco 49ers and DeMarcus Ware of the Dallas Cowboys. Ware and Willis won the Award in 2008 and 2009, respectively. "In addition to his ferocious play in just his second NFL season, the panel was impressed with how fellow players and others in the Packers organization describe Matthews as a great teammate and citizen off the field," said Hub Arkush, publisher of Pro Football Weekly. "He truly embodies everything the Butkus Award is meant to be about." Matthews finished the regular season with 60 tackles, 13.5 quarterback sacks, 5 tackles for loss, 1 interception for touchdown and 2 forced fumbles. He has added 13 tackles, 3.5 sacks and a fumble recovery in the Packers' three playoff games so far. He became a first round draft pick in 2009 after walking onto the USC football program. He played high school football at Agoura Hills High School for his father, Clay Matthews Jr., who played 19 seasons in the NFL for the Falcons and Browns. Considered one of the greatest football players in history, Butkus was inducted into the Pro Football Hall of Fame in 1979, following an illustrious career with the Chicago Bears, University of Illinois and Chicago Vocational School. Meanwhile, his son Matt was a defensive lineman for the University of Southern California, and joins his father in philanthropic efforts. Green Bay Packers standout linebackers Clay Matthews is honored with the 2010 Butkus Award(R) professional trophy.